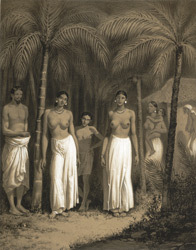 Lithograph of a village nine miles from Kandy in Sri Lanka inhabited by the Rodi tribe by L.H. de Rudder (1807-1881) after an original drawing of May 1841. Prince Aleksandr Mikhailovich Saltuikov and published in Paris in 1848. The Rodi, who are famed for the beauty of their women, were at one time outcasts from society or 'Untouchables' and their history is a mysterious one. They are either the descendants of Princess Ratnavalli or of a tribe of hunters from another location and earned their living by soliciting for alms or by weaving ropes used in the capture of elephants.